This is the first of a series of posts about color mixing. Clue 2. Notice that the purples are vibrant, like rainbow colors or gem stones. (Another word for this vibrancy is “saturated.”) This is a tip off that the red used to mix the purple was “Fuchsia,” not “Cadmium Red”. Cadmium Red yields muddy (desaturated) purples when mixed with blue. The first thing I check when I’m going to mix colors to match a picture is whether the purples in the picture are saturated. That tells me immediately which red to use. Clue 3: The yellow in the design above on the right is lemony rather than golden. This tells me that Zinc Yellow was used rather than Cadmium Yellow. Cadmium Yellow has what we call “undertones” of red while Zinc yellow has no perceptible undertones. If you were to mix the tiniest bit of Cadmium Red with a whole lot of Zinc Yellow, the mixture would look nearly identical to Cadmium Yellow. Cadmium Yellow, on the other hand cannot be modified to look like Zinc Yellow. There is no way to take out the red undertones. The brightness of the oranges is another clue. If Cadmium Yellow, instead of Zinc Yellow, had been mixed with Fuchsia the oranges would have been duller. Clue 4: We have identified the red (Fuchsia) and the yellow (Zinc Yellow). All we have left to identify is the blue. Just by looking at the purples, we can tell that Turquoise wasn’t used. Premo Turquoise (which contains some white) mixed with Fuchsia yields a soft, tropical looking purple, not the deep, rich purples we have here. That leaves Ultramarine and Cobalt Blue. Discerning between these two can be tricky because the differences are more subtle. This is a situation where practice in color mixing comes in handy. I know from experience that Cobalt Blue yields brighter greens than Ultramarine, which is a darker blue and has red undertones. The colors you see here were mixed from Cobalt Blue. Another clue is that I can actually find Cobalt Blue in some areas of the designs. Cobalt Blue can be modified to look like Ultramarine, but Ultramarine can’t be modified to look like Cobalt Blue because you can’t take out its red undertones. This triangle consists of Skinner blends from Zinc Yellow to Cobalt Blue to Fuchsia and back to Zinc Yellow. 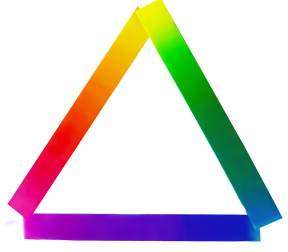 This triad yields the purest, most saturated and vibrant blends of any 3 Premo primaries. Not only that, within the blends you can find hues that approximate the other primaries: Cadmium Red, Cadmium Yellow, Turquoise, and Ultramarine. This would not happen with any other combination of primaries. This entry was posted in Caning, Color, Kaleidoscopes and tagged Carol Simmons, Color, Color Mixing, Kaleidoscope Canes, polymer clay, Polymer Clay Classes, Polymer Clay Colorado, Polymer Clay Teachers, Polymer Clay Techniques, Polymer Clay Workshops. Bookmark the permalink. Very informative. Thanks for sharing. I too am a Premo! user and do not understand the decisions for the new colors. I feel they took a lot of creativity out of the process. I hope they listen and put those colors back on the list. Thanks for your comment, Kelly. I plan to send them the link. If they read the post maybe they will have a better understanding of the consequences of their actions. Thanks for continuing to enlighten and amaze us with your work !! Good to hear from you. I’m glad you found it enlightening! Thanks for that interesting post. I just made my first color scales using Maggie Maggio’s template. I used those same three primaries and was really amazed at how every nuance of color was represented from the careful mixing of the three. I don’t understand why they stopped making those two colors either. it is a serious problem. Thanks for the comment, Roberta. I made my first color scales in a class with Maggie and Lindly 15 years ago! That was such an interesting article Carol — so clear and precise just like your work! I totally understand why Polyform took away the main primaries — They are obviously not interested in the few artists in this world who can mix and combine colors but they are mainstreaming for the average person (or child) who would prefer to use the clay straight from the package and not mix their own colors at all. They are totally missing the boat but I don’t think it has hurt their sales at all or they would change back. Money is generally at the bottom of things and the way they have gone must be a lot more lucrative for them. I personally have quit buying any Premo clay as I find the consistency way too soft and mushy. I love the new Kato clay now that it is much softer and easier to condition and their colors are more true than the Premo. Thanks for your response Carolyn. I tried Kato for a while but it was too unpredictable. I’m waiting until it stays the same for a year or more before I try it again. Carol, did you mean unpredictable in color or texture? If you meant texture I understand they were still trying to get rid of the old stock. I order all of mine from Shades of Clay in Canada and Margaret told me she has all the new formula now and that is what I’ve received in my last order and the previous one. Some people complain that it is too soft now but I don’t find that at all. It is definitely not as soft as Premo clay but is much softer than before. At least I no longer need the rubber mallet and it doesn’t crumble which is good. I know Premo has those gorgeous pearl and metallics which I believe Kato is now working on so we will see what happens there. I know there is always room for improvement where the clay supplies are concerned. WOW. Really puts it ‘in the light’. Very informative. Thanks, Carol. Sorry to hear about your back, Sue. I haven’t worked with the Pomegranate yet. Maybe I’m too pessimistic but I suspect it is a mixture of Fuchsia and Cad. Red. I have done color studies a hundred or more times and I’m still learning from them. I had thought Polyform reconsidered and decided to keep Zinc Yellow and Cobalt Blue available in 1 pound blocks, but I sure cannot find it anywhere online. Do you have a source? Polymer Clay Express and Munro Crafts have them but in small blocks. 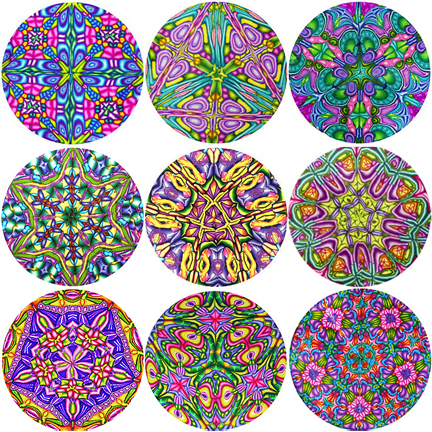 Having tried and failed at some kaleidoscope canes just today, because of colour choices mainly, I’m fascinated by your post – I use Fimo Classic exclusively, but I’m wondering if starting with the Premo primaries (provided I can find two of them, of course *eye roll at Polyform*.) would teach me more about colour choices. I used to work exclusively with Fimo classic and even then I mostly mixed primaries. When I started teaching large numbers of beginners, though, I switched to Premo because it is so much easier to condition.. I’ve been pleasantly surprised with the results. Do you have Lindly and Maggie’s book? That has some good exercises for learning about color. Try taking a picture you really like and mixing colors to match. That helped me a lot because it kept me focused on what the goal was. When I just worked from an idea in my mind I’d lose track of what my initial vision had been and I’d end up with something different. BTW, I’ll be teaching in the UK in September 2012 and color is a major part of what I teach. Good luck! The Lindly/Hounani book is on my ‘to get’ list – getting to grips with colour is my goal this year! I tend to try working from colours in my head more of the time too, and forget to plan out a proper colour palette for kaleidoscope canes – needless to say, I now have *very* good recipes for dingy grey, and mud brown *G* I think a lot of the trouble also stems from my inability to mix a good true red. Good luck with your UK course – I wish I could attend! Thank you! The thing about caning is there is so much to think about… compatible colors, light/dark contrast, simultaneity (how the colors will look together when the cane is reduced), controlling distortion and so much more That’s why it’s useful to do color exercises – they isolate color considerations from everything else. I’ve have some color knowledge, but that was extremely helpful. The nuances, and why, helped a lot. Also the observation such as being able to get zinc yellow to cad yellow, but not the other way around, made so much sense. Thank you so much for sharing. Debbie, You are welcome. I am so appreciative of all of you who have taken the time to comment. Thank you for posting this! It came just in time, I am working on my 2011 Christmas design and moaning that I wanted my colors to be brighter this year. I use Fimo Classic, and tend to use the golden yellow, Red, and Blue as my primaries. I think I will try the Yellow, Magenta and Blue combination out and see what happens. Jenny, That is a big change! If you want to tone them down a bit, you can add a little mud. Yeah, it is a big change. I will test the colors out first, before I make the cane. Just to be sure it’s what I want to do. But I feel I need to move outside my box and see what happens! What a pain it all is. Fimo is either too stiff or too soft. Sculpey original too crumbly. Kato still varies, and comes in packages so big each color would be a lifetime supply for someone like me. Cernit too shiny, except for the very beautiful earthen (“Savannah”, for instance) colors. Premo is just about right, with colors that work really well, but they’re messing with us. At this point the new Studio series looks pretty good. Studio is made by Polyform (like Premo and Sculpey) and it has changed this year as well. I think our best bet is to lobby Polyform to give us back zinc yellow and cobalt blue. I routinely leach my clay to get it to the right consistency, so too soft is not a problem for me. Too hard and too brittle are entirely different matters. Being a new clayer, please tell me what you mean by “leach my clay to get it to the right consistency.” Would this help me with my consistency issues when accidentally mixing Premo or Sculpey with Fimo Classic? LOL, toldja, new clayer here; didn’t MEAN to mix those babies together in a cane & sure wish I hadn’t, now! Leaching clay removes some of the plasticiser and makes the clay firmer. o	Stack the sheets of clay between sheets of blank paper or cardstock and place a weight on top. o	Check the clay after 1-2 hours and then periodically to determine whether more leaching is needed. o	The sheets of clay will be drier on the outside than on the inside so check them by running folded sheets through the pasta machine several times. When you finish, the surface should be barely tacky.) If you are not going to use the sheets right away, store them between plastic sheet protectors or plastic wrap. DO NOT STORE THE SHEETS BETWEEN SHEETS OF PAPER OR CARDSTOCK: THEY WILL CONTINUE TO LEACH AND WILL BECOME UNUSABLE. For the lonnnngest time I just DID NOT GET IT when trying to understand which colors I should have chosen to combine when making my canes, because they just kept resulting in canes with no pizazz. No umph. Even though I was putting together what I thought were high contrast colors. NOW I understand! Thank you, thank you, thank you for this very informative “Color Conscious–Vibrant Color Blends” post, it’s made a huge difference now that I finally “get it”! I’m so glad the post was helpful, Winona. Thanks for the comment! is there any way of emailing me those in black and white so i can colour them in myself?? No, I’m sorry, but you could save them from the posts then print them in black and white on your printer.